Welcome to the blog! I'm Jenni, photog mom of 5 who loves all things Disney, dark chocolate, and enjoying the beautiful state of Colorado. I love preserving memories for my own family and would love to help you do the same for yours. So stop and stay awhile, check out the latest sneak peeks, and let me know if you'd like to visit about a session! Sign up with your email address to receive news and updates, and other VIP information each month. And be sure to check out the latest edition here to get caught up on all JLP news! We respect your privacy.All emails collected are for newsletter communication purposes only. You will get an email from Mailchimp confirming you want to be on the list. Please complete confirmation to receive emails. As a free welcome gift, click here to download your FREE guide to taking better photos! Hi everyone! 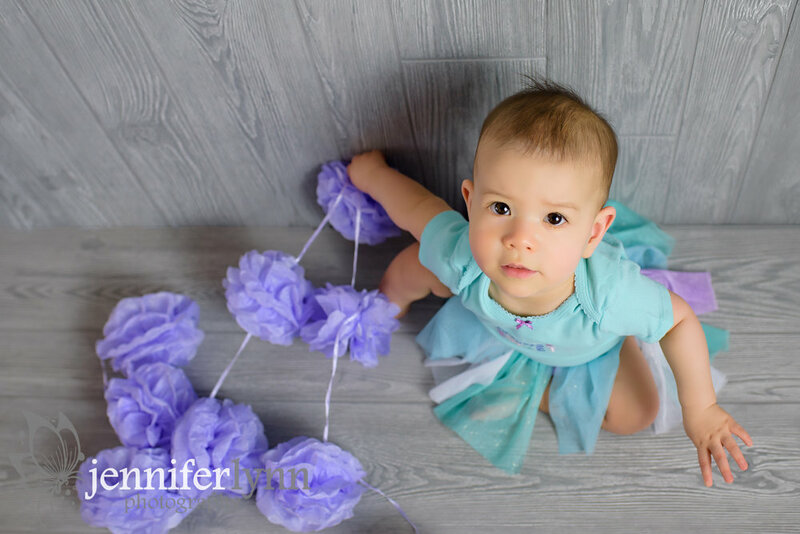 Check out what's new in the life of Jennifer Lynn Photography and what's happening in the studio right here on the blog! And be sure to like and follow me on Facebook and Pinterest for inspiration and new ideas fresh from the studio. See you around! Want your FREE guide to Taking Better Pictures? Sign up with your email address to receive your free PDF sent to your inbox. Check for your free guide in your inbox. Breakfast with Santa form for receiving your photos from the event. 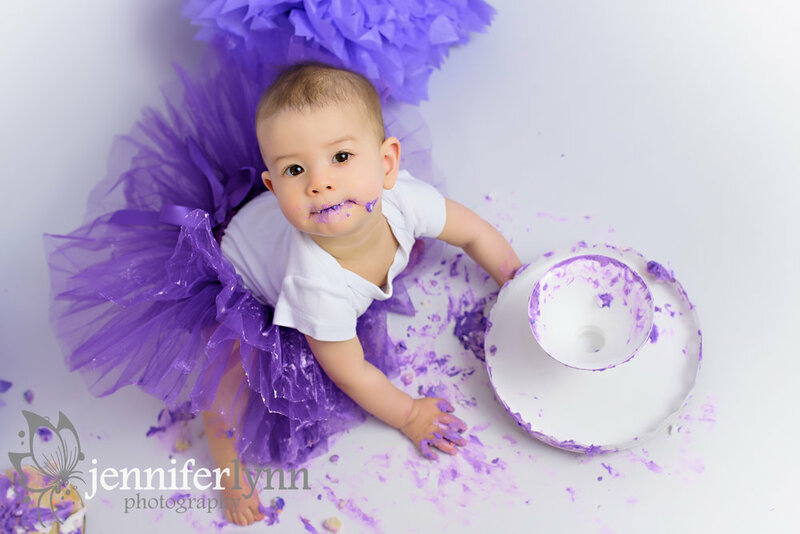 After mainly boys for cake smashes this year, Miss Emiko came by yesterday for her first birthday photos and a cake smash themed with girly tutu's and lots of purple. Mom and Dad brought different goodies and decorations for her photos and Emiko loved the crinkly paper balls and lavender balloons. And I must say I loved the different tutus with sparkles - there's something about a baby in a tutu that just makes you smile. We started with some nice photos of her with the grey wooden backdrop and she was so sweet to sit as I gave her the different letters spelling "one". Then before she could decide to explore the studio, I put her in a big round basket and let her play with the party decorations again. She even gave a few big smiles for Dad, who I believe was jumping up and down behind me! Emiko also loved the white chair and, of course, wanted to stand in it and explore. Dad did a great job making sure no baby was harmed in the taking of these photos, and Emiko had fun sitting like a big kid and then holding a purple balloon for a few photos pre-messy cake. I then had fun using all the great purple party decorations to set up for her cake smash. They had the cutest wiener dog weights to hold down the helium balloon, and I'm frankly surprised Emiko didn't want to play with them once she was let loose! 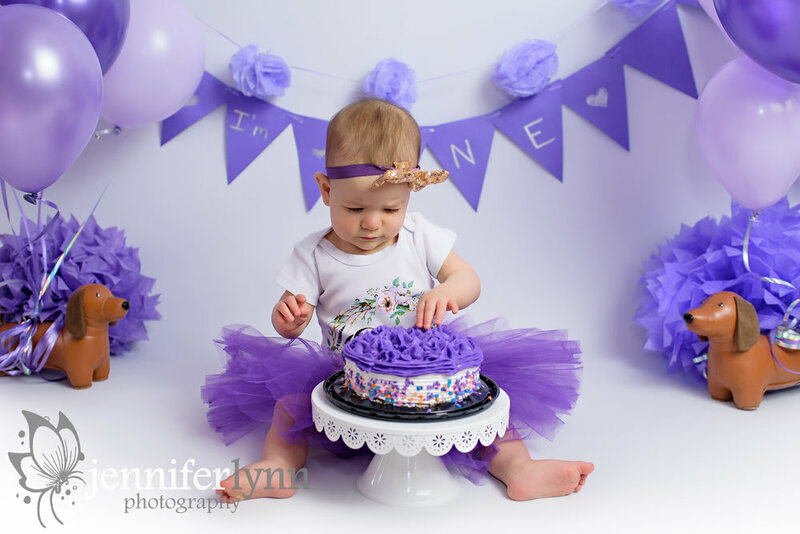 Emi didn't quite know what to think of her cake or how it tasted, but she was just adorable with her massive purple tutu and truly gave it a try. She even let me get her feet in the cake. I think the part she enjoyed most about the smash, though, was when she shoved the cake off the stand at the end and then proceeded to try and put icing inside the bottom of the cake stand. I truly love watching how every baby handles their cake smash sessions - they are all so unique and it's a joy to see how each one reacts to their first birthday treat. A big happy birthday to Emiko who turns one later this month! And thanks to her parents for such a fun afternoon and for allowing me to be part of these special memories. Thinking of booking a session for your child or baby? It's never too early or too late, especially to make sure you preserve all those milestone memories of baby's first year! Contact me today to book your session and ask about my baby milestone package for all of baby's first year. CONTACT ME TO BOOK YOUR SESSION TODAY!